Clonakilty U18’s hosted Killarney-Killorglin at Shannonvale on Saturday in a Munster Plate Quarter final clash. The 1pm Kick-off proved excellent timing as the rain passed off just before kick-off, the wind eased and the Pitch was in good condition which all meant good conditions for Rugby. Not a situation that looked likely all morning. Clonakilty took early control of the fixture against the Visitors racking up 3 first half tries for a 19-0 lead. Clonakilty were playing with the Breeze and once they settled were able to get into good attacking territory. The opening try came from the backs launching a good Strike move stretching the defense from Left to right and making it to the opposition 22. Good ruck ball, excellent hands and straight running as the ball swept back across the field to Liam “Lomu” Barry to finish in the left-hand corner. Clon kept up the pressure and 5 mins later Ben Lovell carried over Just to the right of the posts. It came from some good work and when Rob Downey Found space around the edge of a ruck he was stopped 5 metres out. Some good carries and recycles narrowed in the defense and a few passes sent Lovell on his way. Clon were on a roll now and varying it up nicely. Darragh O’Connor was using the boot to good advantage with the wind to get territory and with the visitors Lineout malfunctioning somewhat the game visitors were finding it hard to get a foothold in proceedings. The visitors were working hard however and had some very good ball carriers and a kicking game of their own. Craig Bateman, Michael White and Steven O’Hea were putting in strong defensive work to keep them off the score board. Clonakilty were back on the attack again and again got behind the defense to find a quick ruck 5 yards out. Darragh O’connor took the ball flat and crashed over. Tynors 2 from 3 in the conversion stakes taking the score to 19-0 at half time. The Visitors started the second half strongly and managed to exert some early Pressure on Clon. Clon’s Defense was again called into action and they were finding themselves on the wrong side of Referee’s whistle for a few Penalties. A crunching tackle by John Allen Byrne ended a promising Killarney attack. Clonakilty needed a spark to kick them into life in the second half. It came 15 mins in when Ben Lovell took a quick tap penalty in the Clon 22 and ran hard and straight. He went the distance to dive in under the posts. That settled Clon and they began to move the ball better. The Clon Bench were also to make an impact. Jamie Santry came on for Lovell and made telling impacts both in defense and attack. Sean Sexton was showing up well when he replaced Michael White. Clon again stuck a couple of sweeping phases together sweeping across the line with both backs and forwards handling to send Loose head “Lomu” Barry over in the corner for his second. Returning from Injury Tony O’Connell entered the fray and before his shorts got dirty he was off down the wing. An excellent back move saw Bateman hit Santry with a beautifully timed pass. With sentry drawing the last defender he set O’Connell off on the outside and he was not to be caught by the cover. Killarney-Killorglin kept going however and strung some good play together themselves. They found themselves getting some late pressure on the Clon line and a series of close in carries saw them get over for a tray with 5 minutes to go. 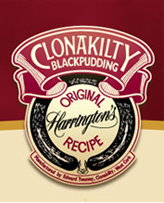 The last score however went to Clonakilty. A neat grubber from Santry just out paced the chasing Fionn McPeake to the safety of touch 10 metres out. An over throw by the Visitors was sized upon by Darragh O’Connor and with centre Bateman hard on his shoulder to take a pass and crash in under the posts. 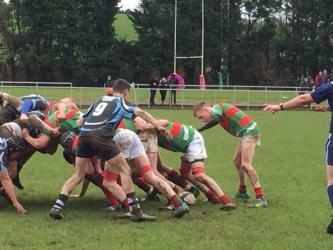 A final conversion and the final Whistle to a 45-5 win for Clonakilty. A semi-final spot against Midleton next Saturday in Bandon, kick-off at 12.30pm awaits the Clon Team who have been improving all season. It was an excellent performance by the full squad of Players and Captain Chris Walton. It was also a game played in right way by both teams, hard and fair with some excellent running Rugby. Clonakilty Panel: Liam Barry, Matthew McCarthy, Danial Godwin, Thomas Tyner, Stephen O’Hea, Joe Collins, Darragh O’Connor, John Allen Byrne, Craig Bateman, Jamie Santry, Kyle Buttimer, Chris Walton, Rob Downey, Michael White, Ben Lovell, Luke Kearney, Alex Hourihan, Fionn McPeake, Tony O’Connell, Jim O’Hea, Sean Sexton.